With all the traditions that come with this time of year, there is one in particular that my friends and I have not celebrated since we started having kids, and the holidays became all about them (thanks for ruining Christmas, kids). Every year, after the tree in Rockefeller Center went up, we would gather as many of us as we could find and ventured into New York City. Some years we had as many as 40 people. Friends of friends added to the crowd. Our tradition was to first go down to Greenwich Village for a few drinks, then uptown to Rockefeller Center and see the tree, fighting the crowds all the way. Afterwards, we would cross over 5th avenue and go into St. Patrick’s Cathedral for the pageantry that was Christmas. That was the plan each year. It didn’t always work out that way. It was December 1990, and just about five months since the birth of my daughter, Amanda. It was also my wife, Arlene’s, birthday. She had not been out since the baby was born so this year we had a particularly large group to see the tree. A lot of her friends from work, who normally were not part of this ensemble, tagged along to celebrate her birthday, and her re-emergence to the party scene. She was sorely missed by them, and in a little while, you’ll see why. 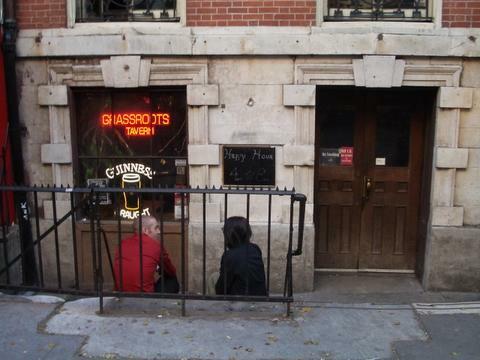 There is a dive bar in the village called The Grassroots that was always our first stop on these excursions. It is three steps down from the sidewalk, and when you walked in you noticed how low the tin-type ceiling was. There was a phone booth by the entrance straight out of a 1940's film-noir movie. A mirror ran the length of the bar, and our doppelgangers marched along side of us as we headed to the back of the room. We quickly filled the place. Shortly after our entrance, pitchers of beers and trays of shots covered our tables. The ‘Roots had a great jukebox, and within seconds everyone was dancing. I danced with one of Arlene’s friends, Karen, who smelled incredible. She was tall and had the greatest pair of legs that went on forever. When I asked her why she smelled so good (smooth) she told me her complete morning regiment that include the perfume Obsession. Needless to say that’s what Arlene got that year for Christmas. Sadly, it did not improve Arlene’s height or her legs. After a few Happy Birthday toasts, and as Arlene grew drunker and louder (is that possible? ), one of our birthday toasts was answered by a woman’s voice that shouted, “Hey, it’s my birthday, too!” Another group from the front of the bar, about half our size and a few years younger than us (turns out it was her 21st birthday), were having their own birthday celebration. After a few more rounds our two groups merged into one super-drunk group. Arlene and her 21-year-old counterpart quickly became friends. Someone pointed out the time and said we should leave to see the tree, but that suggestion was ignored. More drinks, more toasts, more dances with Karen and her amazing scent (too creepy?) and many more calls to see the tree (which were ignored) followed. As the time went on Arlene’s head sank lower and lower as she had a slurred conversation with her reflection in the bar top. Eventually we collectively knew it was time to leave so we left the bar and hailed cabs for our trip uptown. Several blocks from Rockefeller Center, with traffic at a crawl, we paid the cab fare and decided to walk the rest of the way. We flagged down as many of our group as we could find and reconvened on the sidewalk outside of Trump Tower. Sadly our new found friends were gone, but we retained much of our original group. Then suddenly, we all had to pee. It was like our bladders synced up when we stepped out into the cold December air. In search of bathrooms we went into Trump Tower, found an elevator, then like circus clowns in a car we packed ourselves in and hit a random floor number. When the doors opened, we fell out into an entrance way filled with men in tuxedos and women in evening gowns. They turned to look at us as we made our drunken apologies, re-entered the elevator, and were off to find another floor. When the doors opened again we waited to be sure we would not be intruding on some other gala. When the all-clear was evident we scattered down the hallways looking for bathrooms. I opened a door to find an empty ballroom with a grand piano that stood alone at the end of the room. With my urge to pee gone, I went over and sat down at the piano and started to play. I didn’t know how to play that well so it was just random drunken notes that staggered through the air. It was magnificent. Our bladders relieved, we met outside and that was when I noticed Arlene. The birthday beers and shots had taken their toll; she wasn’t much more than a zombie. I guided her over to a spot on the sidewalk and sat her down. Almost immediately a police officer came over and told me, “You can’t leave her there”. I admit, I hadn’t planned on leaving her there, but in hindsight maybe I should have. I’m sure someone would have found her and given her a good home. I pulled Arlene to her feet, but she was useless; her legs were rubber bands. I hoisted her over my shoulder and carried her through the streets. Needless to say, we didn’t see the tree that year. The tradition changed after that. Going forward it was ‘see the tree’ first then ‘haul your drunken spouse on your shoulder’ afterward. I haven’t been back to see the tree in quite a few years. It doesn’t really matter, though, because I no longer have the upper body strength to carry someone through the streets of New York.